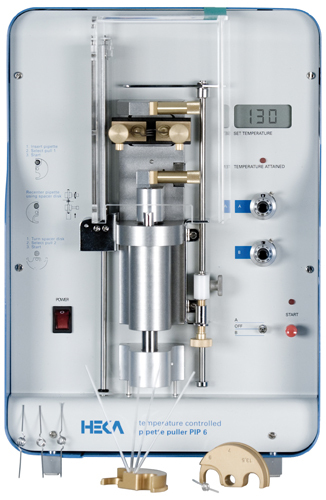 HEKA is proud to introduce the new PIP 6 temperature controlled pipette puller. The PIP 6 has taken all of the exceptional features of its predecessor, the PIP 5, while providing additional improvements to further increase the reliability and reproducibility in the fabrication of micropipettes for nearly any use. The precise temperature controlled heating filament of the PIP 6 provides excellent repeatability in pulling micropipettes. The temperature control works independently of the filament. It is not affected by the filaments condition, age, or make-up material. Therefore, settings do not have to be constantly corrected. This precise temperature control also assures that preset temperature settings are attained rapidly. This feature is especially important for the lower temperature settings of the second pull. The PIP 6 pulls pipettes vertically to assure straight, concentric shapes. The pipettes are fabricated by a two-stage pull at two independently selectable temperature settings. Different spacer disks determine the individual pull length and allow for production of pipettes of different dimensions. Pipette glass diameters of 1.0 to 3.0 mm (thin as well as heavy walled) can be held and pulled. Large, as well as extremely fine tip pipettes can be fabricated. In addition, a new cover plate design allows capillaries up to 150 mm in length to be used. An adjustable pipette stop helps in centering the pipette when mounting in the puller bars. This feature allows equal length pipettes to be easily pulled. Like all HEKA instruments, the PIP 6 is built for reliability and durability. The PIP 6 is CE-certified and is equipped with a cover plate safety switch to prevent filament heating when the cover panel is open. The PIP 6 has an efficient current circuit design which eliminates the need for a powered and noisy air ventilator for cooling. In addition, its compact space-saving design allows the PIP 6 to fit easily on any lab bench.